So what is a thin-client-server-solution, and why should I care it’s Linux Based and Open Source? And moreover, we use Windows. Nice Birkenstocks, but no thanks. Resara has a great set of products and solutions for schools, and the benefits are so clear once you strip out the jargon: Transform your current old classroom and lab computers into brand new ones, with the latest powerful software, and manage everything from one machine for very little money. They wanted an introductory video for their site that would communicate all this and distinguish them. 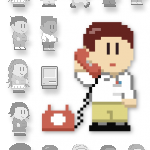 Because the issues facing a network admin is often dealing with old machines, I pitched the idea of an 8bit theme (think boxy Nintendo graphics), mocked up the IT guy “protagonist” and pitched the idea. They were receptive to the informal style and we went from there, bouncing ideas back and forth. Everything in the video is original work, including the music which was designed by our sometimes-soundguru, the talented twangling and bleeping Eric Freeman. “The Voice” is Joshua Pablo Rosenstock. In the process, I revamped their logo, and have since finished redesigning their entire web site. I enjoy working with them personally – a great little team with good ideas, working hard and growing steadily.